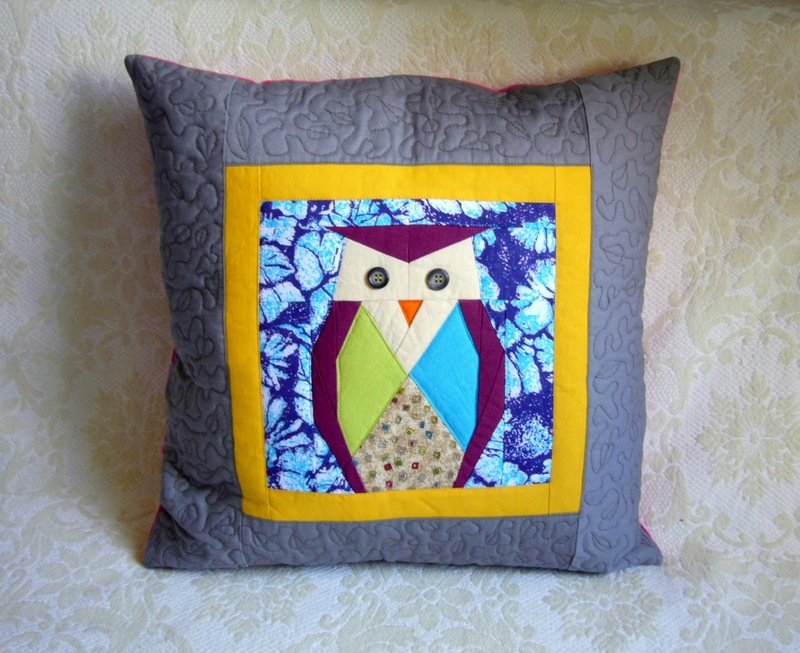 Last week I have designed a new Owl pattern. 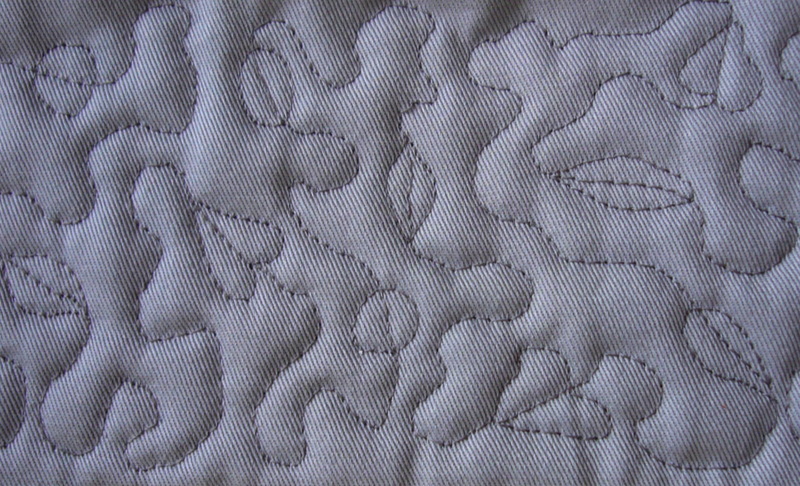 It looks cute and nice on the computer screen, but I decided to test it with real fabrics. 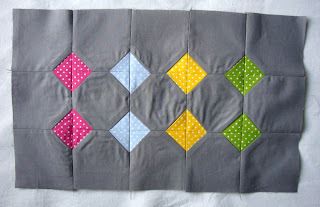 As I have many orphan blocks this time I made a pillow cover using this wonderful tutorial . 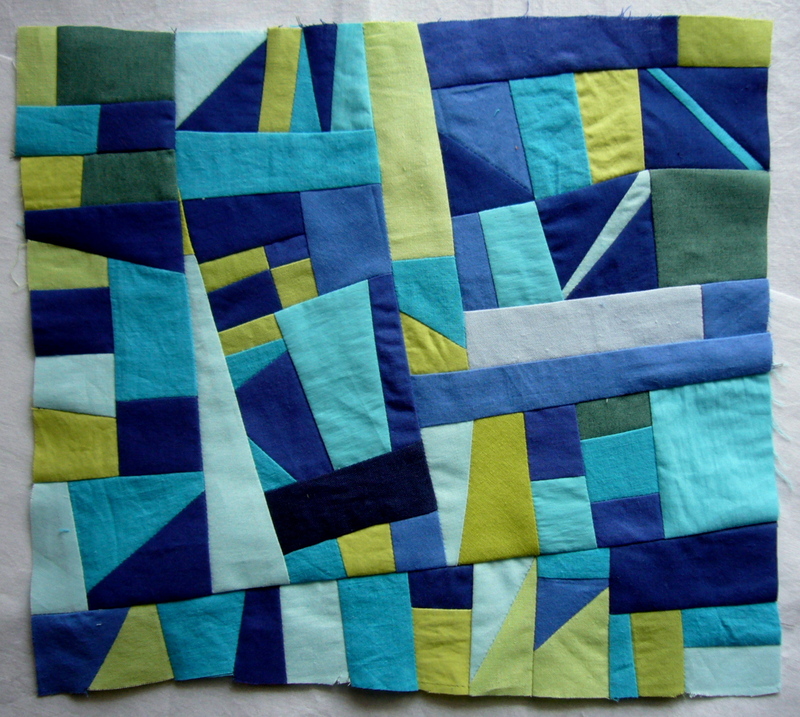 I have added a narrow yellow strip and a wide grey one. 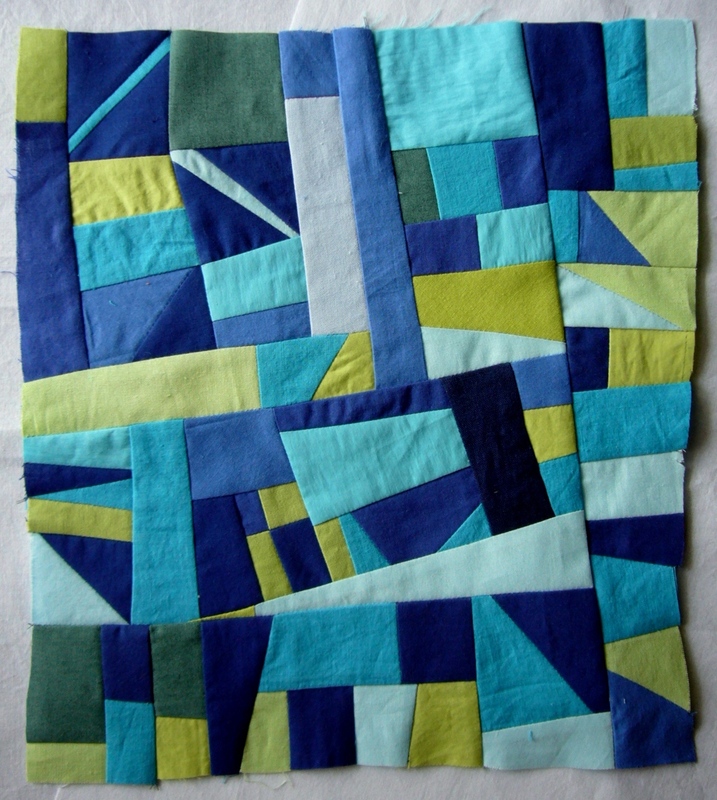 Add batting and make free motion quilting with traditional meanders, but added leaves. It is easy to made. First try to draw with a pencil on a sheet of paper. See the direction of movement. 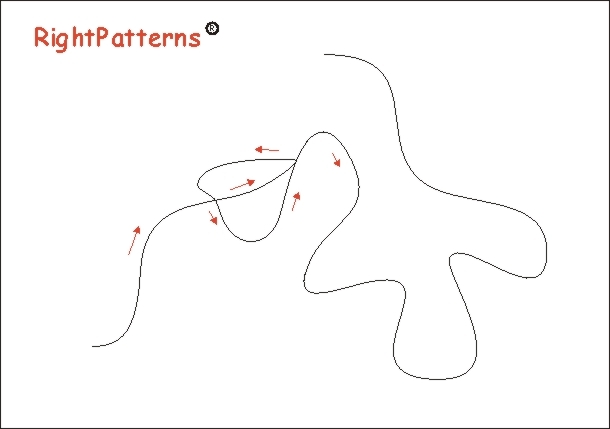 Try to make leaves with different shapes - see the detailed picture. 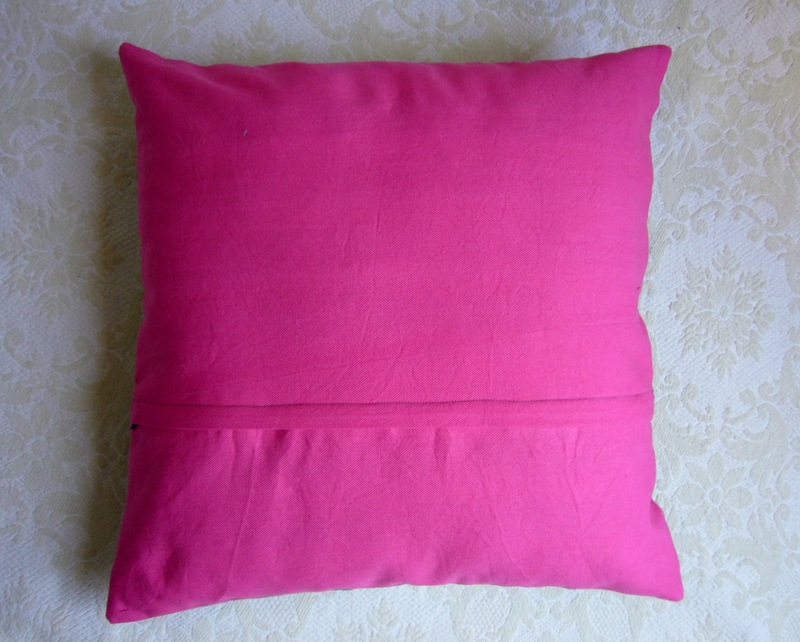 For the back I have chosen a pink heavy cotton fabric. I have seen it in a field of poppies and took a picture immediately. So beautiful and so lonely. This happened almost 2 months ago. Yesterday I remembered this picture when cleaning my hard disk. I had to make something - mini quilt, wall hanging or mug rug. Let everyone names it as he likes. I have made some sketches and began applique the poppies. The background is sky and green field. Each poppy is made from two hues of one color. Do you remember how looks the petals of the poppies. They are so tiny even transparent. And when two petals cover each other they look darker. The first one would look like framed. The second one would be as extension of the picture. So I have chosen the second. Chain stitched the handles, add some embroidery for the stamens in the center of the white poppy. I love the final look. You can find the pattern at CRAFTSY or ETSY. 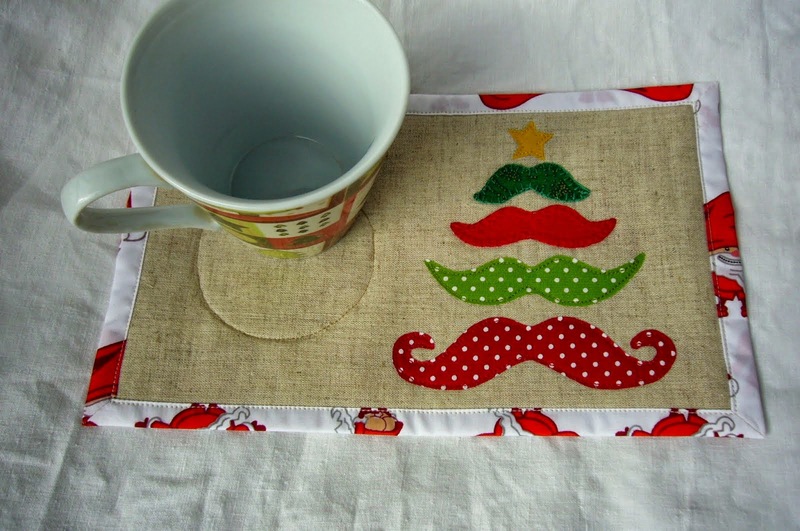 Some people say my mug rugs are like a mini art picture and have to be hang. 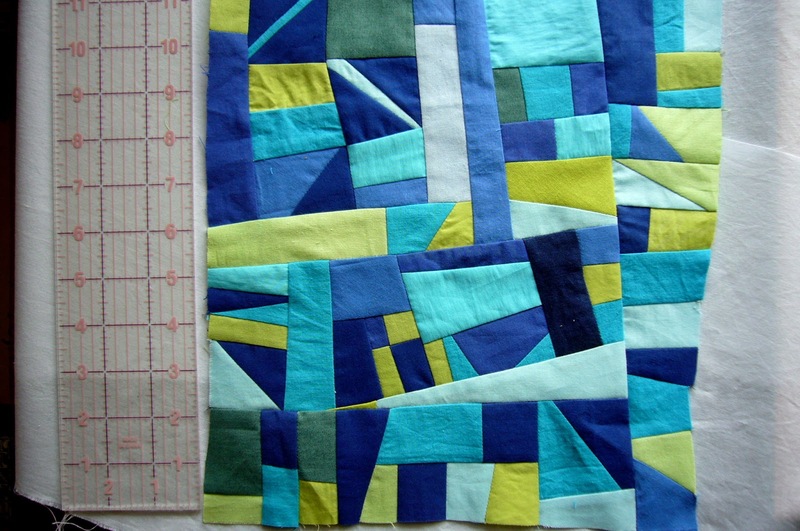 What is scrap in quilting? What size are the pieces you are collecting for future use? 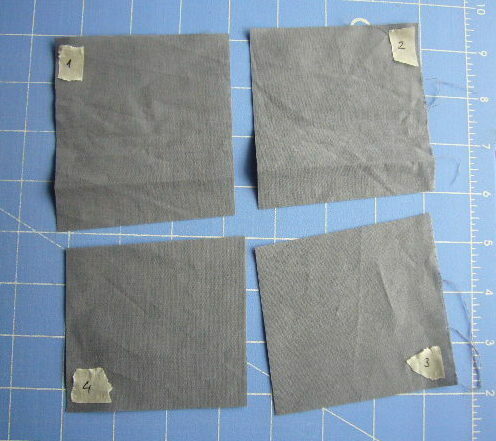 Does it worth to store them or simply cut entire fabrics is better decision? I collect all pieces. It is not a joke - absolutely true. My problem is to sort them and find them when needed. I know, I know. You will say - a boxes with labels do excellent work. Simply label them 1 inch stripes, 2 inches stripes and so on. This sounds ridiculous for me. I will give you an example an you will understand me immediately. A week ago I have free time, but was too nervous to begin a new project. So I have get some pieces from my scrap basket, separate blue hues and green hues only and began collect them. 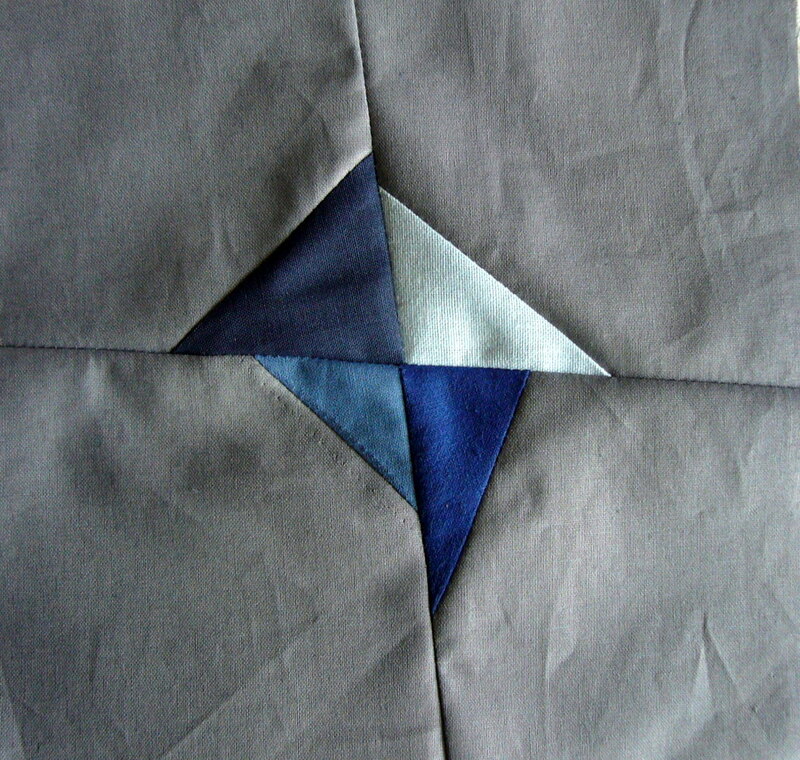 There are triangles, squares, small stripes. 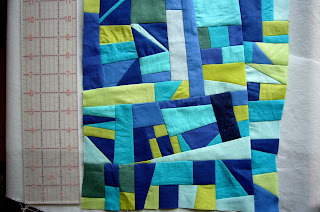 I have to specify that I used pieces as they are - I haven't cut them in half or etc. 3 hours later I was absolutely calm and satisfied. Are you sure you know what we have to label SCRAP? As I promised in my previous post I took a picture while sewing next color diamonds and made a tutorial. You will need four different hues of one color - this time it is pink. So I have chosen light pink, fuchsia, hot pink, tropical pink. The back ground is gray. 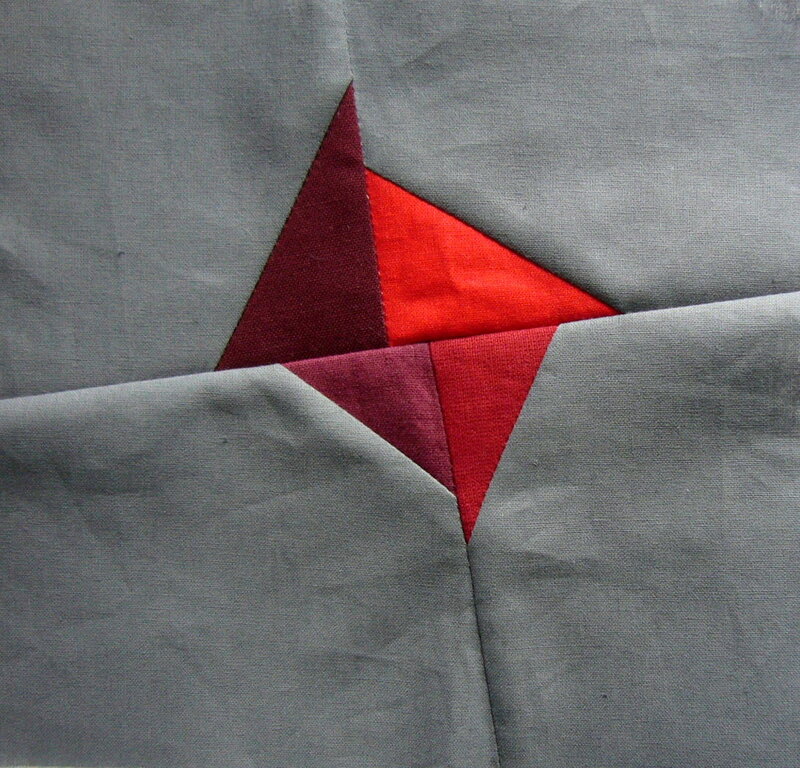 Cut a grey square and divide it in four. My square is 7 inches. Label with a piece of tape and number. Cut pink triangle, place it at the corner and stitch. 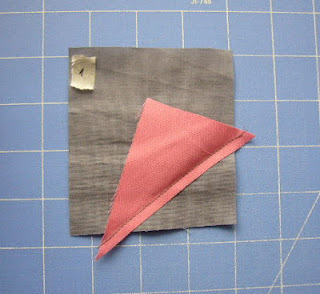 Turn back and trim exceed pink. 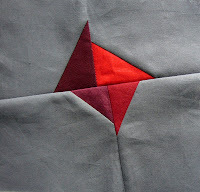 Cut the gray corner at 1/4' seam allowance. I used a scissors and done without a ruler. 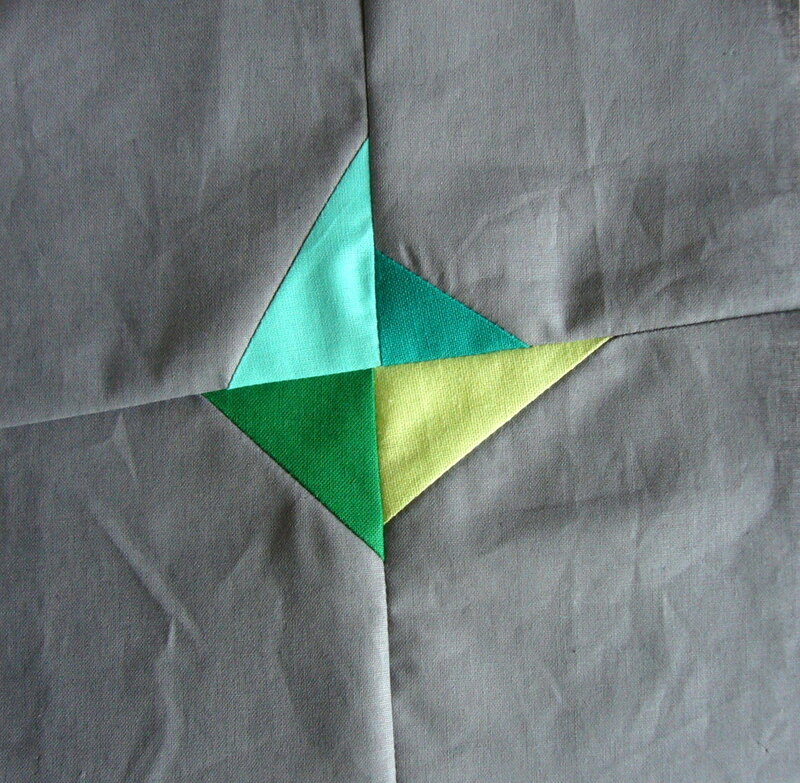 Repeat with other three pieces and order them according numbers. Sew right side together 1+4 and 2+3, iron the seam allowances in different direction and then stitch together. 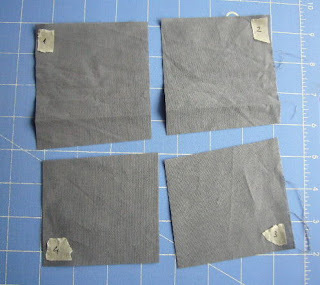 Remove the tapes and iron well. P.S. 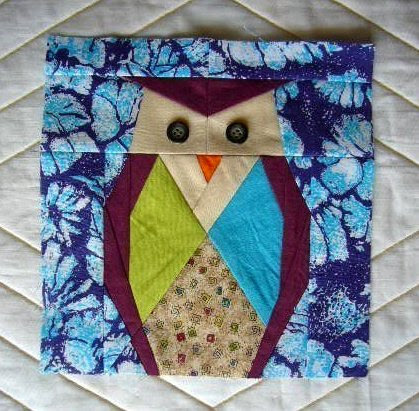 Today ( 17/06 ) I have found on Pinterest a whole quilt made this way. 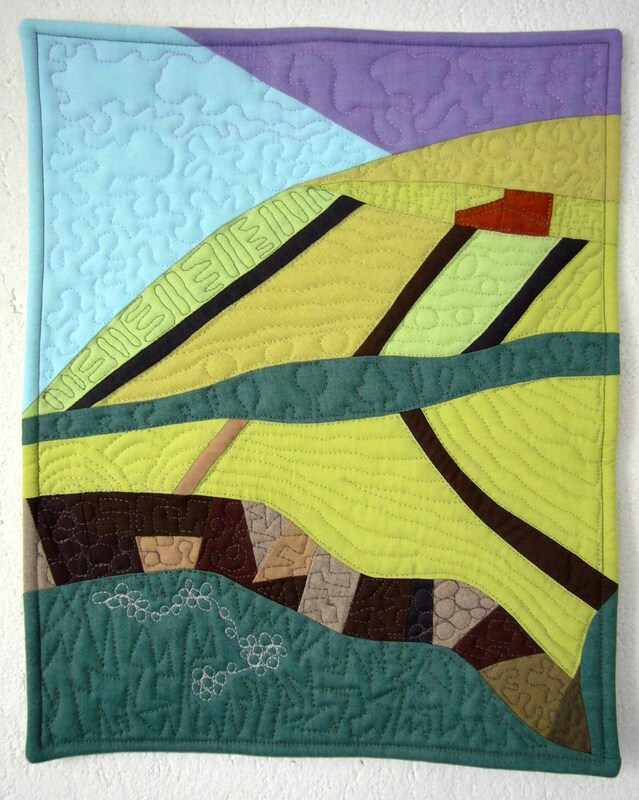 Here is the post from Teaginny designs. She named Wonky Kites. How lovely! 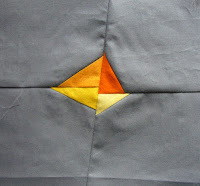 I have the task to design a small patched surface not so difficult to be sewn even from beginner. So I played with grey and color squares some days ago. The result is quite good. I used the ripper once when have not exactly points. And this have put another idea in my mind. I have to made it. I would take a pictures for the next one to blog a tutorial. Here the short story about the Yorkshire Dales. I have given to my friends.